Palmer Motorsports Park and COM in the news! 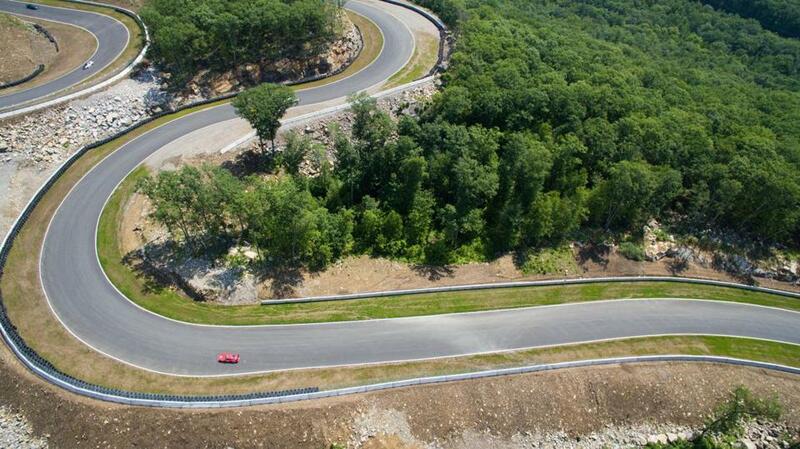 Earlier this year The Boston Globe went out to visit Whiskey Hill Raceway at Palmer Motorsports Park. The writer attended a full track-hosted school day. The writer’s instructor and classroom instructor was none other than Stephan de Penasse. Stephan is a long time COM member and instructor has been COM Sports Car Club’s classroom instructor for the last few years. COM member, instructor and prior driver champion Fred Ferguson has led the project of building and running this amazing facility. We are so fortunate to have such a unique and enjoyable track in our own back yard. Please check out the article below and join us for our final event of the year at this track on October 29th & 30th. You can sign up HERE. Registration for our second visit to New Hampshire Motor Speedway on October 8th and 9th. You can register HERE. We will be running the south oval configuration. The South Oval is one of the most challenging corners of any track we run. Come give it a try! Expectations were high this year for our return to The Glen after a two year hiatus due to the repave. We were fortunate to get two perfect days of weather. Gone are the old red and white curbs- replaced with bright yellow and orange. Those teeth chattering mid-corner concrete patches are now the same smooth pavement found everywhere else. Additional paved runoff has been added making the blue gauntlet just slightly less intimidating. What isn’t gone is what makes Watkins Glen one of the best tracks in the world- fast sweepingcorners, dramatic elevation changes and a challenge like no other. We were all reminded why you just don’t miss a trip to The Glen. A big thanks to James Ray and his wife Rochelle for taking some fantastic pictures again. You can check them out HERE. Super Unlimited – The SU party was crashed by a formula car and a Ford Mustang (sort of) battling it out for FTD. Mike Meyers laid down three very consistent sub two-minutes laps to take second place. It was Kurt Hissong though who nabbed 1st place with a 1:54.766 which was also good for FTD. Super A – Super A had it’s deepest field of the season thus far. Tom Greer laid down a few 2:08s to take third place. Justin Webster was improving by seconds on each lap of his TT. He secured second place with a 2:05.444. But it was Marc Fuchswanz in his flat black Vette that took first with a blazing 2:02.576. Super B – James Laughlin took 3rd place in his very cool Porsche 914 with a 2:11.781. Kevin Williams broke the 2:10 barrier with his bright red NC Miata to take 2nd place with a 2:09.958- with the top up. No one was catching Jake Wile in his white M3 however. All that yarn aero testing must have paid off because he recorded a 2:03.074 to take the SB win. Super C – Once again Chris Parsons laid down some fast consistent laps in his turbo Miata. He took the class win with a time of 2:11.549. Super D – After Mark Swinehart’s Miata relieved itself all over the track Greg Hosselbarth wasn’t left with much competition. That didn’t stop him from laying down some very fast laps in his Miata. His best lap of 2:17.065 was good for the win. T100 – T100 is all about the muscle. Bob Cairns who limped trough the TT with engine troubles conceded 2nd place to his roommate Laura Fleming. No one was going to catch Godzilla on this day however. Donald Piette ran a very brisk 2:02.540 to take the class win. T90 – Jon Harris just edged out another Z06 to take 2nd place with a 2:13.239. Stephen Tise sold his Mustang and bought… another Mustang. It was a bold strategy that paid off with a first place finish with a 2:08.413. T80 – T80 was a very close battle. Victor Larin ran a strong 2:10.839 in his E46 M3 good for second place. He needed another couple seconds to be able to catch David Lapierre though who ran a 2:09.109 in his Cayman GT4 to take first place. T70 – Abdi Garcia made his first podium since 2013. He laid down a 2:15.396 in his Camaro. You knew it was going to be close for the win when two T70 cars rolled through tech inspection after their TT laps. Nelson Barros was feeling confident having run well below the previous T70 track record in his E36 M3. His 2:12.796 ended up falling just short of first however. Jon Cowen’s 2:12.506 set a new track record and took the class win. T60 – Stephan de Penasse earned his first class trophy of the year with a 2:22.245 which was good for fourth place. Roe Cole had the recovery of the event. He pulled his 944 back together in impressive fashion after a T1 mishap in practice to take third place and his second podium of the year. Troy Velazquez couldn’t match the 2:14s he ran in practice but his 2:16.311 was good for second place. Meanwhile on another planet where physics don’t apply, Dave Lemoine laid down a stunning 2:12.998 to beat Nick Fontana’s T60 track record by almost two seconds! T50 – COM new-comer John Spain crashed the T50 party and ran a very respectable 2:20.025 in a spec Miata to take third place in a very competitive field. Class leader Jeff Wasilko found some more time and ran a personal best 2:17.285 to take second place. Dave Wittmer returned to T50 and ran a 2:17.034 to take the win- his first event win since 2013. T40 – T40 continues to be the most interesting class in the club. Larry Leff ran a 2:23.627 to take fourth place. This was his second consecutive trophy in T40. Derek Tangard laid down a 2:22.647 but fell JUST shy of Scott Rosnick who came across with a 2:22.545 good for second place. So wait who won? In the morning practice session this driver was a couple seconds off the pace and needed a rabbit to chase. Scott pulled him around for a few laps and managed to pull him into the 22s for the first time. Apparently Scott showed him too much. Congrats to Tom Cannon who ran a 2:22.039 good for his first class win since the new class rules were implemented. T30 – Frank Sordillo was the only T30 competitor. He recorded a 2:56.862 to take home 13 class points. Our next event is at New Hampshire Motor Speedway on October 8th & 9th. You can sign up HERE. Sights like this are what make COM so special. If you made the trip up to Canadian Tire Motorsports Park (Mosport from here on out ) than like me you probably can’t stop thinking about the experience. Between the long haul, the F1 history, the beautiful setting and the pure speed of the circuit- you got to experience a truly special place. We were fortunate to have two days in the 70s and no precipitation. Many folks were returning for more track bliss while we had a handful of first-timers on hand as well. Our friends from Track & Time up in Canada joined us for the two days as well. A big thanks to James Ray and his wife Rochelle for taking some fantastic pictures. You can check them out HERE. Super Unlimited – Bruce Allen drove the tires off his Exige.. literally. With no rubber left Bruce had to record his one and only time trial lap on his rain tires. Running unopposed Bruce collected the 13 points as well as the overall class lead for the season. Which Lotus will be left standing at the end of the year? Super A – Tom Greer and his Porsche 930 Turbo made it around for the out lap but ran into mechanical problems on his first timed lap and was unable to record a time. It wasn’t going to matter for first place however as no one was going to catch Butch King in his truck. Butch laid down a 1:30.029 good for the class win and FTD. Super B – Bob Brooks ran unopposed in SB. He ran a very strong 1:36.373 take first place points and set a new SB track record. With those points Bob trails SB class leader Dan Preseton by only 2 points. Super C – Peter Fontana win’s the “A-for-effort” award for this event. Two days before Mosport he still had a blown motor sitting in the engine bay. With a little help from his friends at Wile Motorsport a new-used motor was sourced and swapped in. Unfortunately the motor did not hold up for the time trial. Peter ended up running Dave Lemoine’s T60 car to take third place. Will Martins showed up in a very familiar looking NC Miata and took 2nd place with a 1:38.611. Chris Parsons continued to impress taking first place with a 1:37.093. This was Chris’ first visit to Mosport! Super D – The top four Super D points leaders were all in attendance at Mosport. Greg Hosselbarth took second place with a 1:42.910. Mark Swinehart and his fancy new tires laid down a flyer on his third lap and took his second win in the last three events with a 1:41.655. Greg has taken over first place on the season by a single point over Rebecca Harvey. T100 – Despite much peer pressure Bob and Laura did not man and woman up respectively and missed Mosport again. For some inexplicable reason Ryan Catucci left his Civic hatch at home and brought his brand new M3. With the family cheering him on he laid down a 1:37.049 in 100% street trim. Dan Baldwin had the longest commute to Mosport of anyone (Atlanta to Alabama to Bowmanville!). That didn’t stop him from laying down a blazing 1:32.543 in his LS-powered RX7. T90 – Mario “The Most Interesting Man in Canada” D’Annunzio made his annual appearance with COM. He made sure you heard his 1:39.766 good for third place. Benoit Pepin ran a very solid 1:36.196 in his STi for 2nd. Jon Harris in his Z06 was just able to edge out Benoit for the win with a 1:35.407. Jon Harris only needs 1 more point to seal up the T90 class championship. T80 – Victor Larin was the only T80 entrant at Mosport. He laid down a 1:37.269 to take all 13 first place points. With Nick Fontana starring in “Silicon Valley” and out for the season , Victor Larin has taken over the class lead. T70 – Stephen Diaz may have been the first driver to run a Porsche Panamerica in a COM TT finishing in third place. James Ray overcame a disappearing trailer wheel to make it up to Mosport in time. He finished in 2nd place with a 1:40.090. Jon Cowen separated himself from the rest taking the win in his M3 with a 1:36.940 which was a T70 track record. T60 – Roe Cole laid down some very solid laps in his 944 to edge out Troy Velazquez for third place with a 1:40.164. Dave Wittmer’s 14 point tires weren’t all they were cracked up to be so he ended up running a 1:39.900 in what turned out to be T50 trim for second place. Dave Lemoine exploited his inner-Senna and ran an absolutely insane 1:36.940 to take first place and set a very impressive T60 track record. T50 – Vincent Roy made his first COM appearance of 2016 and finished third running a 1:43.948. Jeff Baker’s first visit to Mosport started with lap times north of the 2:00 mark but finished with a 1:42.743 for second place. Mr. Cruise Control also pocketed the most consistent award along the way. Jeff Wasilko hired some local pro help to gain that extra edge. Unfortunately he lost third gear during practice but managed to run a 1:41.490 in 4th gear the whole way good for the T50 win. Jeff W has a strong lead but the T50 field will be a deep one at Watkins Glen. T40 – Julie Wasilko ran some very solid laps and recorded a 1:45.759 to take third place. Tom Cannon just edge out Julie with a 1:45.424 to take second place and his fourth podium of the year. It was Scott Rosnick however that brought his A-game finishing over two seconds ahead of the rest of T40 with a 1:43.250 and a new T40 track record. Scott has a slim class lead for the season but the class is wide open with Tom and Julie remaining within striking distance. T30 – Stephen Hosker woke up on day two wondering if Mikhail El Bayeh was going to show up to defend his Mosport title. Alas he did not and Stephen ran unopposed in T30 to take the win in his McMiata. That didn’t prevent him from pushing hard as he set a new track record of 1:47.172 to beat Mikhail’s mark set last year. There is no time to rest as we are only a week away from our return to the newly paved Watkins Glen. We did not hold an event there in 2015 due to the repave. This event has been filling up fast and will have major implications on the class battles with all the points at stake. We hope to see you there! COM Sports Car Club – News archives for 'September, 2016'.